Miss Sprint Cup, Monica Palumbo, makes an appearance in Victory Lane at Indianapolis after Jimmie Johnson's win in the Brickyard 400. Fort Worth, Texas – Surely you have seen her on the TV, jockeying for position during the typical NASCAR Victory Lane celebration scrum. Lurking. Miss Sprint Cup always is lurking…albeit with a perpetual smile, augmented by the occasional shuffle and the well-timed head-nod. Don’t try these subtle moves while standing atop your Winnebago, NASCAR Nation. Miss Sprint Cup – aka Monica Palumbo – is a trained professional. And her charming sense of humanity, and humor, might prompt you to reconsider the definition of “eye-candy” next time you see that woman wearing the basic black Sprint fire suit. Palumbo and Rhodes alternate race weekends, although the ladies double-teamed the festivities leading up to and after the Allstate 400 at the Brickyard at Indianapolis Motor Speedway. 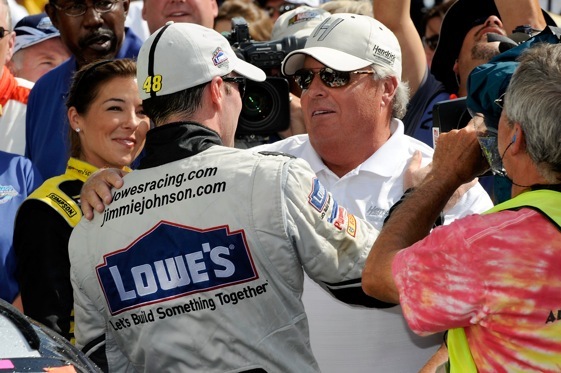 Did you see where Palumbo joined race-winner Jimmie Johnson and the No. 48 Lowe’s Chevrolet team in the traditional kissing of the Yard of Bricks? All part of the job description. At Indy, Palumbo also interviewed team-owner Richard Petty, NASCAR’s acknowledged King, during her typical three-day weekend. During the typical week, she also stays connected with fans via social media like blogs, Facebook and Twitter. “The last Texas race, I was in town for the whole week,” said Palumbo, referring to the Samsung 500 at TMS in April. “At the Samsung headquarters we did a charity event. A lot of people wonder…’Do they fly these girls in just for Victory Lane? To stand there? Really?’ We get that a lot, just because that’s the only thing they see. Attractive ladies gracing Victory Lane traces its documented history to 1971, when R.J. Reynolds’ Winston cigarette brand became the title sponsor of NASCAR’s top division – the NASCAR Winston Cup Grand National Division. A succession of Miss Winstons – some more well-endowed and scantily-clad than others – posed and got cozy and planted kisses on grimy winning drivers through November 2003, when RJR exited the sport and was replaced by communications giant Nextel . With the exception of the hot pants and heels, the job qualifications outlined for Miss Winston basically mirror those of Miss Sprint Cup. As a public relations spokesperson for RJR, Miss Winston’s duties included meeting and greeting drivers, crew members, NASCAR personnel, corporate sponsors, dignitaries, guest and fans at Cup events. Pre-and post-race duties also are similar. Miss Winston was selected after a series of candidate interviews conducted by a modeling and talent agency, and RJR brass. Palumbo, born and raised in the heart of NASCAR country in Charlotte, N.C., took a circuitous route to her current job. Palumbo began acting and promotional work at age 20. In 2001, she was crowned Miss North Carolina and selected Miss Congeniality in that year’s Miss USA competition. “Obviously, I’ve been around racing forever,” said Palumbo, who attended East Carolina University and was graduated from California State University at Northridge with a degree in theatre. ”I moved out to California and pursued that for years and fell into NASCAR. Some of those moments, she admitted, can be awkward. Case in point, an interview Palumbo once conducted with a genuine Cup heartthrob. Back to Miss Sprint Cup’s office – Victory Lane. Isn’t it awkward to be standing there among all that euphoria, in silence? “Yeah, absolutely,” Palumbo said. “Because your instinct is to want to get in there and say something. Sometimes I think I’m going to get hit by a Coke bottle or a Gatorade bottle. Or Budweiser or whatever. Sometimes you’re thinking, ‘A Gatorade bottle is about to hit me in the head at any moment.’ I mean, we get soaked, but I’ve never been hit in the head with a Gatorade bottle. Be good TV though! “And people come up to us and are like, ‘We see you back there smiling. What are you smiling at?’ So I let them know that we’re aware of – I’ve named it – ‘The Shuffle.’ We shuffle to get in the camera. It’s like, obviously, we’ve got to get that Sprint logo in there. That’s our main job in Victory Lane – other than congratulating the driver. That said, some fans have been known to get carried away when they find themselves within pawing distance of Miss Sprint Cup. “There have been times where men go in for a picture and they like pick me up, or they’ll try to kiss me,” Palumbo said. “Just race fans… ‘Hey let me get a picture!’ I’m like, ‘Yeah.’ And they’ll throw me over their shoulder. I’m like, ‘You going to buy me dinner tonight or what?’ Yeah, there’s some crazy things that happen at the track. Sometimes people want me to take a picture with random things. Like this guy had a fake taco that he took around to places and had people take pictures with his fake…he called it his Demo Taco. And I thought that was really bizarre. That was an awkward moment. Yeah, his taco was not too big. well it sounds like you are a johnny come lately nascar fan any way, probably a 24 or 14 fan, yea i know the type. Monica is a pro and is a past miss north carolina, so what have you done lately? Have some respect for the sport. Maybe you should go back to football or baseball where you belong. Remeber NASCAR is a true sport…everything else is just a GAME!!! Thank you for doing this article. We always look for Miss Sprint Cup in Victory Lane! It is nice to know that they do more than just stand there agreeing with what the drivers are saying. I hope to see Miss Palumbo the next time we are at TMS! I think Monica is awesome! I saw her at Infineon and gave her a “You Go, Girl!” She looked up and gave it back to me. I have much more respect for the 2 Miss Sprints than I do for the local eye-candy umbrella girls.